Far too many adults in the United States suffer from moderate to severe periodontitis. Most avoid treatment because of fears of aesthetic complications, predictability of treatment, affordability, and fear of pain from the procedure. Right now there are millions of Americans living with advanced gum disease. However, only a small percentage of this number will seek professional gum disease treatment. Research continues to link advanced gum disease, periodontitis, to a variety of health complications including diabetes, heart disease, pancreatic cancer, and low birth weight. While gum disease may seem like an inconvenience or irritation in its early stages, it is a significant health risk that should be taken seriously. Until recently, treatments for gum disease have been more invasive. Proper treatment meant either full gum disease surgery to cut and remove affected gums, or extracting teeth and replacing them with dentures or dental implants. Recent advances in dental technology have provided a more precise alternative with the PerioLase® MVP-7™ and the LANAP® protocol (Laser Assisted New Attachment Procedure). 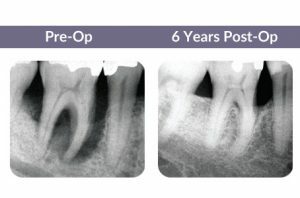 The LANAP® procedure utilizes the highly specialized PerioLase® MVP-7™ laser to provide a non-invasive, more predictable results driven laser gum disease treatment. The protocol selectively targets and kills the bacteria that cause gum disease, removes damaged gum tissue, and creates new attachment of healthy tissue back to a tooth’s root surface. LANAP® treats gum disease without the pain, gum line recession, and increased sensitivity traditionally associated with periodontal treatments. Additionally, LANAP® offers more predictable long-term results. LANAP® is the first and only FDA cleared laser protocol on the market for fighting gum disease. The laser surgery’s ability to kill the bacteria that causes gum disease is backed by both domestic and international independent studies. LANAP® can save natural teeth that otherwise would require extraction by promoting bone regeneration. LANAP® saves teeth, reduces pocket depth, and regenerates bone growth to achieve optimum periodontal health. Have questions? Looking for a customized assessment of your oral health and whether or not you are a candidate for LANAP®? Quickly fill out the form on the right to request a consultation or give us a call at 480-782-1131.